That can be a pretty intense subject. How do you learn to be a good wife? How do you be a good wife when you have a husband who is hard to live with? There are so many books and gurus out there who offer advice about marriage, how do you whittle it down to the truly useful information? Where will we start writing scriptures about Husbands & Wives? So, simply put, we will begin at the beginning, and see what we can learn from the Bible about the marriage relationship. As Genesis shows us, God created man and woman, and in so doing, created the first marriage. The easy part is how to define marriage. The hard part is how to live in it, day by day. Fortunately, God has given us everything we need! As we go through these scriptures about husbands & wives, we will look at examples of couples who did things well and some who did things poorly. We will read what we are told about these couples and see what can be learned by their choices. We will also read verses that lay foundations for how couples should be. There will be verses that teach about Christ’s love for the church and how that is to be reflected in the marriage relationship. Our verses will even help us to see how submission is to work in the marriage relationship -what submission is and what it is not. 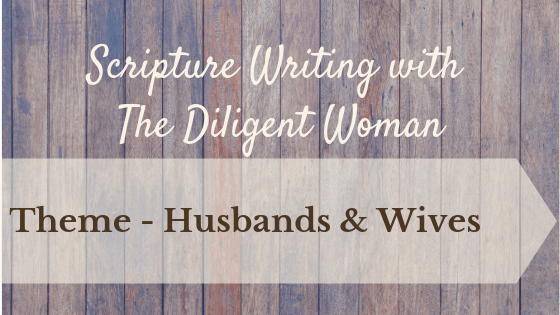 Will you join us for the next 31 days to write about husbands & wives? Even if you are not married, this study can help you understand God’s relationship with His people since it is so often compared to a marriage. General teachings about how to manage any relationship can also be gained. It is not only a study for the married or about to be married. Relationships can be hard. Marriages go through ups and downs. When we do not have the same goals spiritually, financially, and for our family, it’s even harder. Jump in and study God’s word to see what He has to teach about husbands & wives. Sharing these scriptures should help us to know better how God wants our relationships to work. For the next 31 days, spend each day writing scriptures that teach about Husbands & Wives. I encourage you to go beyond just writing the verses too. This is a study that creates natural questions for application. What did it take for them to do what they did? Is there something to be learned by applying the opposite of what these examples did? 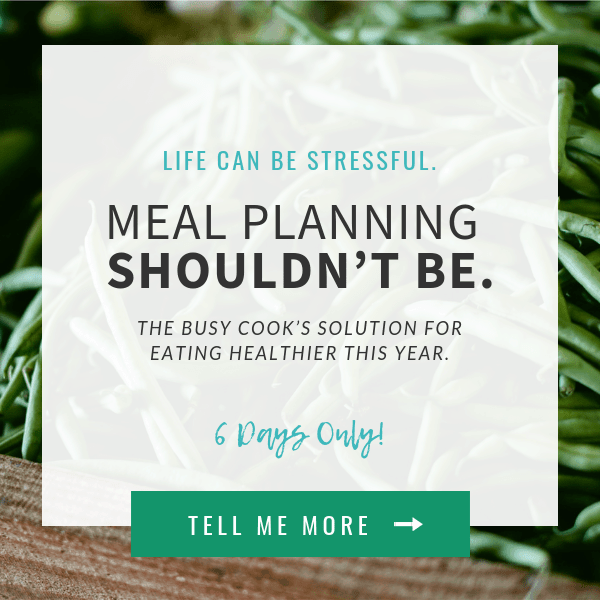 Even though the context is marriage, how can I apply these things to my behavior and choices alone? What lessons can I see they learned from their choices? The writing of the scriptures alone will give you a deeper understanding than just reading them. Meditating on those scriptures through the day AND praying that God help you see how to apply them in your life will take you even deeper. PS – Please share your scripture writing on social media. You never know who you could encourage by sharing the work you are doing to grow in God’s word! 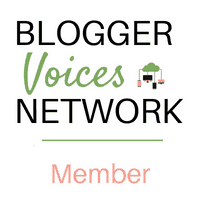 Connect with us in The Diligent Woman Facebook group. 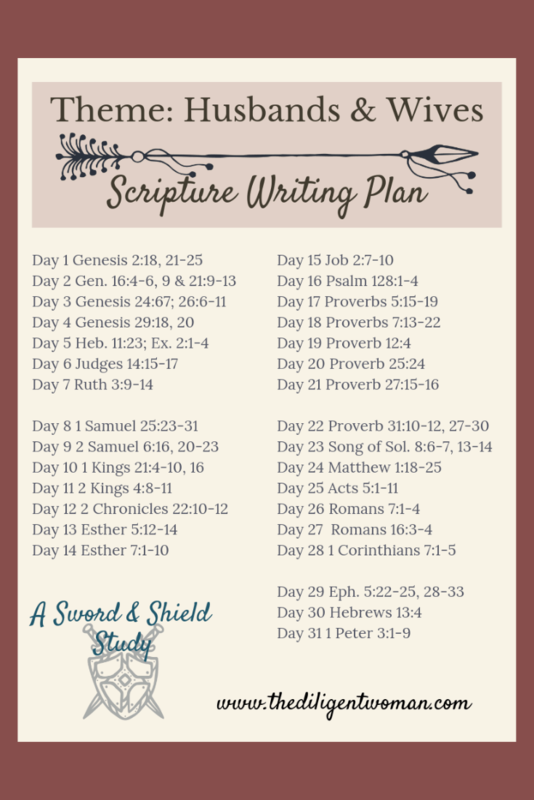 Each day I share Bible Marking suggestions for the day’s scripture writing. You can share in the Diligent Woman Group, on Facebook, Instagram – wherever you “hang out”. Use the hashtag #DWScriptureWriting or #ScriptureWritingClub so we can search and find what you have shared. Wouldn’t it be fun to see God’s word all over the internet this way? 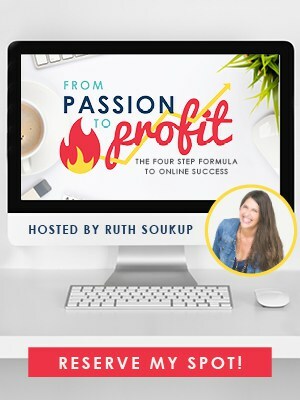 Want to get these delivered directly to your email? 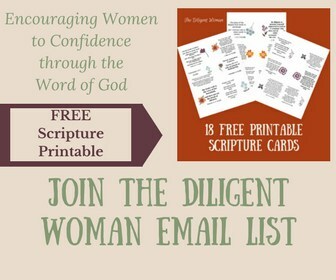 Join The Diligent Woman email list. You will receive bonus content and updates from The Diligent Woman, including the current bible study that is going on. 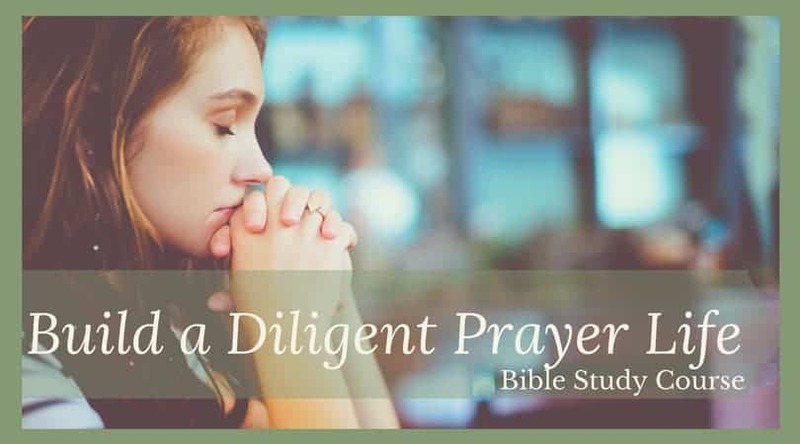 Looking to dive deeper into prayer?